Since 2001 I've been creating software for the Macintosh that I wanted to use. Then I decided to see if anyone else wanted to use it. Much to my surprise they did and AfterTen Software was born. WeatherMan was that first product it displayed weather information from the National Weather Service in a format that I wanted plus it fed my home automation system with weather data using AppleScript. CIDTracker was next since I wanted my home's Caller ID information recorded and sent to me in an email so I knew when I missed called at home. When the weather and hourly updates from the NWS wasn't fast enough for me I branched out into personal weather stations and WeatherTracker was born. Please explore and if you have any questions please visit the support forums or send me an email directly. Currently supports the Davis Vantage/Vue, Oregon Scientific WM918, WM968, WMR100, WMR200, WMR300 and LaCrosse 2300 series personal weather stations. 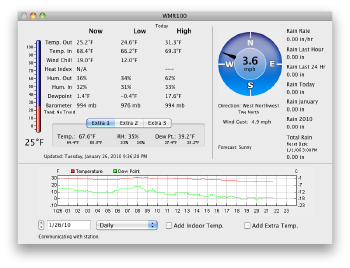 There is beta support for Davis Monitor/Wizard personal weather stations. 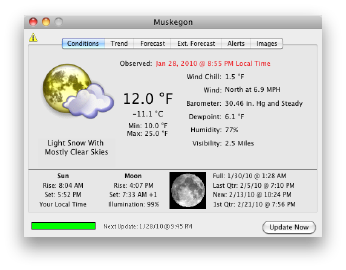 Simple display layout shows all primary weather information on one screen. Saves data to SQLite database or any DB via ODBC connection. Ability to upload web pages to FTP server for real-time website weather updates. Update your Twitter account with custom weather updates. Downloads and displays 24-48 hours trend data. Downloads and displays up to 8-days extended forecast. Decodes and displays called ID information from a modem attached to your Macintosh, including Apple USB modem. Shows list of received calls. 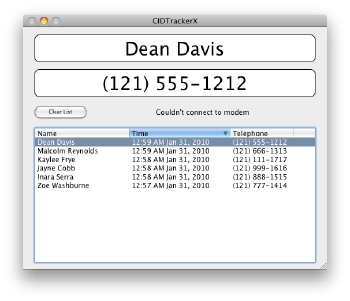 Network to other copies of CIDTracker or many other caller ID programs on the Mac or PC.